*$50 savings – Price includes all taxes, fees and fuel surcharge. This is the Ultimate Kauai Adventure. Discover the inaccessible areas of Kauai from a birds-eye view on this amazing 55 minute Kauai Helicopter Tour. How Many for Open Seating Helicopter Tour? How Many For First Class Seating (2 frontrow seats)? * For Guest over 240 lbs to 290 lbs Upgrade to whisper Star for no comfort charge. 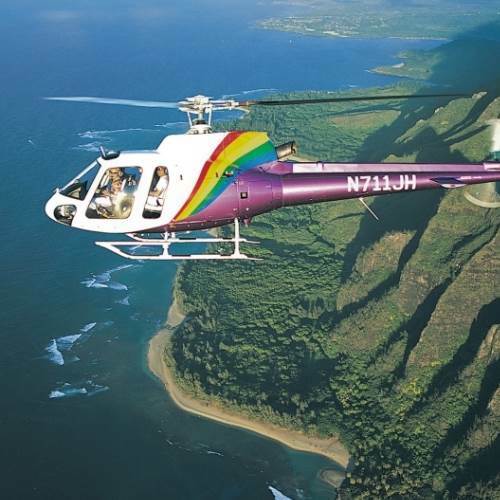 Kauai Ultimate Helicopter Tour of pure beauty as you discover Waimea Canyon, “Grand Canyon of the Pacific.” Mount Waialeale known as the wettest spot on earth, the nearby Alakai Swamp, home to several rare species of plants and birds. The Na Pali Coast, with its dramatic razor sharp cliffs and the emerald green hanging valleys is spellbinding no matter how many times you see it. As you make your way north you will see Hanalei Valley and Bay. The Wailua Falls also known as Fantasy Island Waterfalls will come into view as your tour comes to an end. Learn about the history of the island from local pilots that call Kauai home. Restrictions: Helicopter weight and balance changes with every flight because of passenger weight, pilot weight and length of flight (fuel weight). It is important that we have accurate body weight from every passenger. *If a standard airline seat belt is too small or you weigh over 240 -290 pounds book on the Whisper Star upgrade for comfort seat requirements. Cancellation Policy: 72-hour advance notification required for cancellation. You MUST obtain a cancellation number in order to avoid a no-show charge. We did a 4 pm ride and were blown away by the experience. There are many helicopter tour options on the island but this is the one to take. A very reputable company. Professional, with local pilots. My wife who is naturally anxious about flights was put at ease with the debriefing and staff. Do it! The helicopter tour was well worth it! Kauai is so beautiful and we are so glad we got to see the island this way. We enjoyed our pilots sense of humor and flying skills. Glad he maneuvered the copter so everyone could enjoy the scenery.